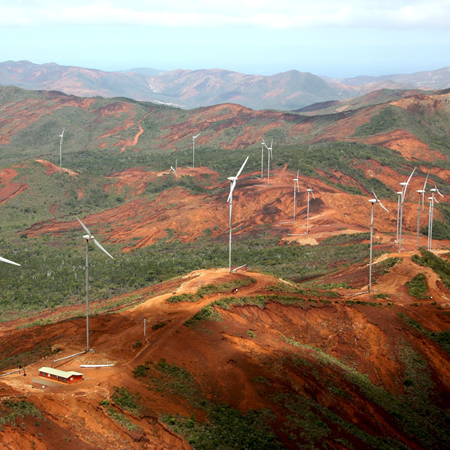 Prony wind farm is part of renewable energy development continuity in French overseas territory and, in particular, in New Caledonia. With 84 wind turbines generating 21.5 MW of power, Col de Prony wind farm is powering the electricity needs of the entire city of Mont Dore and its 27,155 inhabitants, the second largest city in New Caledonia in terms of population. The local electrical authorities and QUADRAN chose Vergnet’s wind turbine technology for this project due to its robust design and proven adaptability to perform in cyclonic areas. Our technology has been designed and rigorously tested to deliver high performance in environments with extreme climatic conditions including marine, salty, dusty, cyclonic, warm and cold environments. The VERGNET PACIFIC subsidiary, based locally, is in charge of the wind farms operation and maintenance services as well as installation, connection, training of staff, following the facilities during their life (20 years). Over a four year period, Vergnet successfully delivered and installed 84 wind turbines, generating over 21.5MW of power for the area and directly benefitting the large population of Mont Dore. Together the four sites at Col de Prony wind farm deliver significant savings, including oil savings of 5,470 t and a reduction in the production level of harmful gases including CO2, NOx and SO2 of 21,080 t. By diversifying the energy mix with renewable wind energy, we delivered a clean and reliable source of energy providing a strong return on investment and supporting the territory’s overall growth. In February 2012, New Caledonia was hit by Cyclone Jasmine, a category 4 storm (on a scale up to 5), with gusts exceeding 280km/h (175 mph). Thanks to its tilting towers, the Vergnet wind turbines withstood the ferocious storm and no damage was done.